After seeing the post race condition of the Turbo Schnitzel Merkur's tires at last years LeMons South, I knew that we'd need an extra set for Our Lady. After just 10-ish hours of racing the previously new Kumho Solus KH16 tires were toast. The tread was weirdly smeared and was starting to chunk out at the edge of the tire. 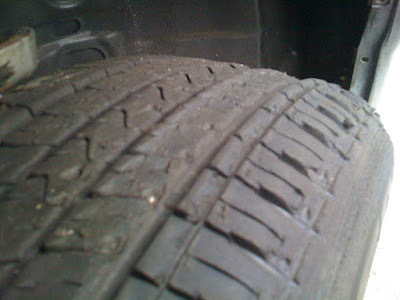 The Kumho's were H (130mph) rated tires, with a 440 treadwear. 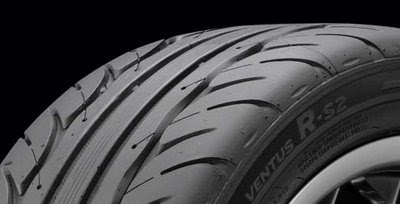 This time around we settled on the Hankook Ventus R-S2. It's got a 200 treadwear that puts us just above the 190 minimum for LeMons. It's pretty cheap at $75/tire and has a V (149 mph)speed rating. We knew we'd need two sets based on how chewed up the Schnitzel's tires got. Getting an extra set of cheap wheels would let us switch out a complete set without the downtime of mounting the tires. I always assumed that low profile tires had some benefit to racing, but the only big performance gain seems to be the ability to fit bigger brakes inside of large wheels. There is still a good reason to upgrade the steel wheels on the Civic: tires. There's not a lot of performance tires that are made to fit a 13x5 wheel. 15" seems like the sweet spot for tires. Hence our junkyard search for some 15x6 wheels. Unfortunately for us, the Civic has a 4x100 bolt pattern. A pattern shared by such notable sports cars as the Geo Prizm and the Mercury Tracer and ..... the Miata. A few Miata's came with 15" wheels from the factory, but most had 14's which are much more plentiful on Craigslist. While there isn't a huge selection of performance tires at that size, there are a few. The Hankook tire we picked is available as 195/60R14. $600 + tax and shipping later and they are on their way.